Holy moly, this week was terrible! Terrible for the environment, terrible for morale, just all kinds of not very good. Even if you are a conservative, it really didn't have a lot going for it- some embarrassing lying and a lot of nonsense. But I had a few bright spots, and I bet you did too! Let's share. 1. 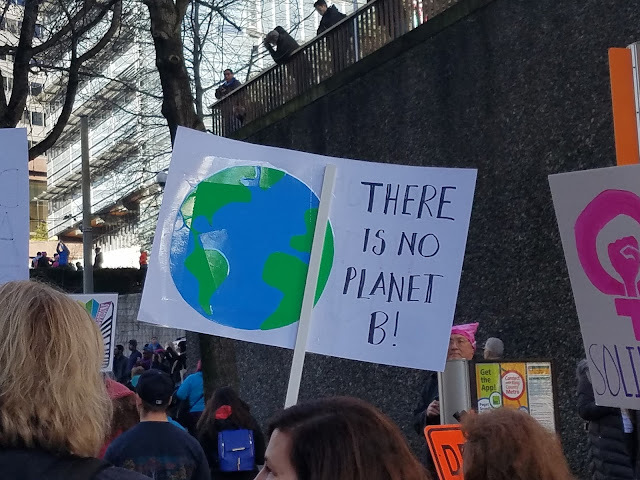 This Sign- I loved participating in the Womxn's March in Seattle, and I hope the sheer force of this action made leaders take women and their concerns seriously. We won't back down, and they should expect fierce, organized, and determined opposition when they overstep. I loved seeing everyone out supporting one another, I loved the positivity of the day, and I loved marching with people I really care about (including my sons, whose future is really what I am fighting for). I was excited by all of that, but even more, I was totally inspired by how much of the March was about the environment. I saw so many signs and people pushing back against the destruction of the environment for capitalistic gains, and it made my heart sing. If everyone who marched stopped using plastic (a division of Big Oil like Exxon's profits), started buying things used, and just used their everyday life and choices to take a stand, we could change the world. I know that is true on so many issues, but I feel optimistic when I see the sheer number of people who just really care and truly want to make things better. That's what I am going to think about when I feel like despairing. 2. Hand me Downs- Almost everything in this picture, except the Green Toys barn in the left corner, was used by someone else before this baby. My favorite is the superman cape, which his cousin sent out of his old toys. 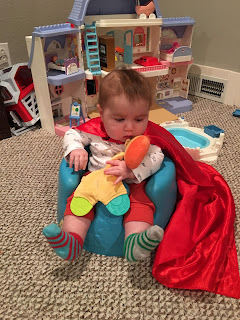 The bumbo chair is Buy Nothing. The dollhouse is used from eBay. Even his mismatched socks are hand me downs! After 2 years of really focusing on buying things used and now I can't look around the house (or at myself) without seeing something that someone else used first. We have saved so much money and so much stuff from landfills. Honestly, it feels really good, though it makes me slightly less happy than our superhero baby trying to figure out how to reach his feet. 3. People's Climate March- April 29th. Let's do this. If our greedy and destructive leaders help the general public wake up to the grave problems our consumerism causes the environment, then I am pretty freaking pleased. That's quite a trade off, but I am trying to see some bright sides here. If you are interested in standing up for the environment (taking the National Parks' lead- Leslie Knope is totally behind it), check with me and I can help you find organizations and efforts worth getting involved in where you are. Plenty are also non-partisan, because I know lots of Republicans care about their stewardship too. 4. 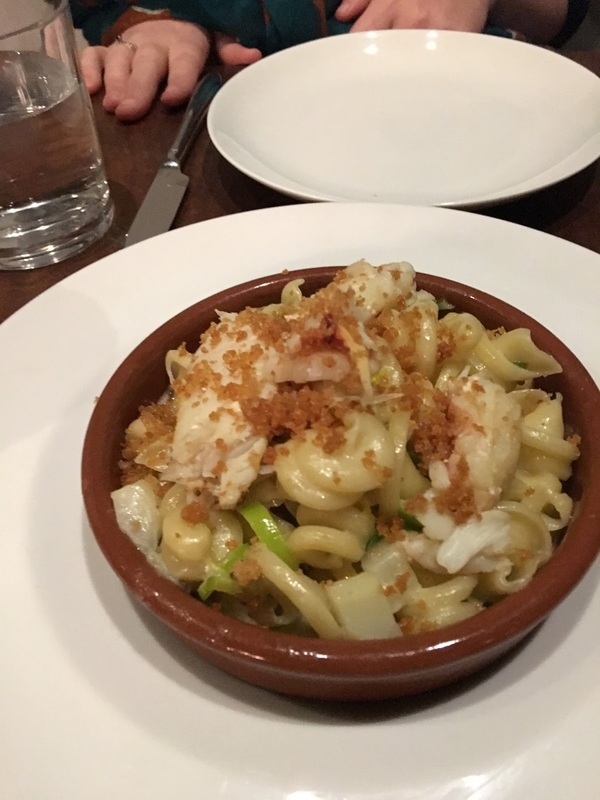 Fancy Macaroni and Cheese- We went to a fancy pants restaurant this week, and we had some fancy pasta name with crab and bechamel sauce to split. We didn't realize what we were doing, but we ordered the fanciest mac n cheese of my life and I loved it. Also, it made me weirdly hanker for kraft mac n cheese, but since we are trying to phase out plastic packaging and tons of chemicals in our food, I am thinking trying to make our own might be a super fun new project. Also, why did God make carbs so good? 5. Kiss my Face- I am switching over to bar soap to avoid all of that plastic packaging, but it takes a while to find the soap that is the right balance of ethical and not sucky. Right now, we are using Kiss my Face olive oil soap, and it seems to really be working. You can buy it wrapped in paper, it doesn't have any dyes and wasn't tested on animals. The downside is that it was made in Greece, which is a pretty long trip. Still, this one is enough of a winner that The Boy is using it without complaint. Anyone have a bar soap for face wash that they really like? There is a vendor at Applefest who makes the best face soap in bars with goat milk and tea tree oil- I always buy a bunch of them so I don't run out. They don't have an etsy store or anything but you can email them and they'll mail you an order- I will have to see if I can find their card anywhere!